Tools for Chairs help in the repair and removal of gas cylinders, casters and sockets. • Removes worn, expanded or broken sockets from all types of wooden furniture quickly and easily. 1. Insert the extractor rod into the socket. 2. 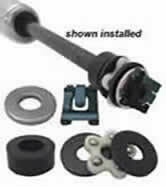 Turn the cylinder and the puller rod cuts its own threads into the socket. 3. Turn the hand wheel until the socket is extracted. Universal Tool For The Aeron Chair!